When we talk about drying food in the dehydrators, there are varieties of foods which come in our mind. One of the most favorite food items is dehydrated apples. 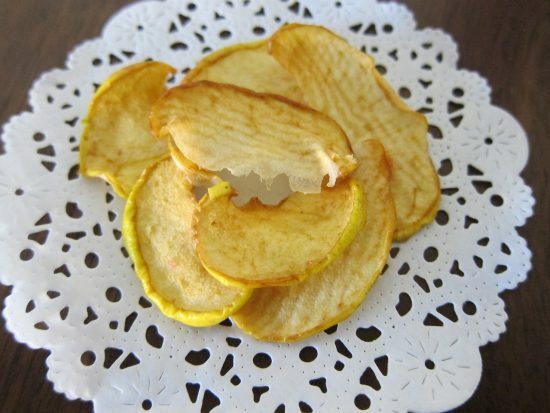 Dehydrated apples are tasty snack which you can make at your home in just a few years. The home-dried apples are healthy food that you prepare without the addition of any preservatives or chemicals. But, do you know that how to dehydrate apples in a food dehydrator? Well! You can easily make your dehydrated apples at home without much effort. In fact, the quality (no chemicals) of the apples dried at home is far better than the store bought food. You can consume them in any season whether winter or summer. Nowadays, as people are getting more health conscious, you can gift this to your friends and relatives in the form of gifts instead of sweets or chocolates. In the below article, we will tell you about the steps of making dehydrated apples in a much clarified manner. The entire process of dehydrating apples in a food dehydrator is so easy that any person can do that. What Do You Need to Make Dehydrated Apples? Are Dehydrated Apples a Healthy Option Than the Fresh Apples? The first important thing, of course, is a food dehydrator in which you will dehydrate apples. This machine needs to be a set at a particular temperature for drying. It takes few hours for completing the whole process. The next thing is the trays of the dehydrator over which you will place the apples after drying. These trays come along with the dehydrator. You need to buy some fresh apples for drying. The quantity of apples depends upon the space available in the drying trays of your dehydrator. Thus, you should buy the apples accordingly or otherwise you can dry your apples in batches. For cutting the apples in proper shape, you need a knife or slicer. But if you want to dry apples without their skin, then you must have a peeler also which removes the skin of the apples very efficiently. You also need some plain water and vinegar for dipping the apples after cutting. You can also use the lemon use as a substitute. After completing the drying process, the dried apples have to be placed in some airtight jars or any vacuum zipper bag. It helps in keeping the apples away from coming in contact with the air. It makes the life of the food lengthier also. How can you begin the drying process without picking some good apples to form the grocery store or from your garden? Well! The apples which you are going to use for the drying must be of high quality and try avoiding picking any bruised, mushy or rotten apples. Don't you want to dry apples in the proper hygienic way? Thus, after getting the apples to your home, just simply rinse them under the plain water. Some of the grocery store owners put stickers on the apples which you must remove efficiently before cutting. If you find any bruised or soft parts on the apples, then cut that out. This step is an option for some of you. It is not mandatory that you have to remove the skin of the apples. It is entirely your choice. Some of you may prefer dried apples with skin, and some of you might like dried apples without skin. Thus, if you want to remove the skin then, only use a peeler as they can take out the skin in very easy and fast way. If you are on a healthy diet and want to reduce some fat, then it is advisable to make the dried apples along with their skin. The skin of the apples is very healthy and includes lots of fiber which ultimately helps in weight loss. Now, next step is to cut the apples in around 1/3rd inches thickness. But, the thickness must not be more than ½ inches. Or else, the apples will not dehydrate well. You can save the cores of the fruit for making apple scrap jelly, apple scrap vinegar, or homemade apple pectin later on. After slicing the apples, you have to bring them in the acidulated water for some time. Do you know that how acidulated water is prepared? Well! For making the acidulated water, you need to have one tablespoon lemon juice or vinegar and add then in the one-quarter of water. It mainly benefits in avoiding the Browning (change color when coming in contact with the air after cutting) of the apples. Now, drain your apples in a strainer. You must remain them inside the strainer for few minutes so that all the water drains out completely. However, if you have the shortage of time, then you can use the dish towel for soaking the excessive water from the apples by little pressing. Now, you have to place the acidulated and drained apple slices over the dehydrator trays. You must remember that all the slices of the apples should not touch each other and there must be some space left between every two pieces. When you place the slices of the apples with some space in between them on the trays of the dehydrator, then it benefits in even drying of the Apple from all sides. It is one of the necessary steps which help in the uniform drying of the food. Now, after placing the slices put the trays inside the food dehydrator for drying. You have to set the temperature are 130 degrees F of the machine. Now, turn on the dehydrator and dehydrate the apples till they become crispy and leathery in texture. It will take around 12 hours for finishing the whole drying process in the dryer. As soon as your apple slices get dry, turn off your food dehydrator. Now, take out the trays from the machine and let the apples cool down at room temperature for around 10 minutes. This entire process is known as "conditioning." The last and final step is to store the dried apples after they get cool down. You need to transfer them to airtight glass jars or vacuum zipper bags. You must remember that the jar or the bag should be sealed tightly so that no air can enter inside. You may label the jars for your convenience and ease. It will help you in knowing about the contents of the jar. You can also write the date as well as the year of drying so that the oldest jar can be used first. Usually, the shelf life of the dried fruits ranges between 6 months to 1 year. If you want to increase the shelf life of the dehydrated food then, try to keep them away from direct heat or sunlight. It will be more beneficial if you keep them in the dry, dark and cool place. It is well said that an apple a day keeps the doctor away, but some people have a misconception in their mind that the dried apple is not so much healthy as compare to the fresh one. But that is not true at all. We agree that the taste of the dried apple cannot match up to the taste of the fresh apple. But, the dried apple is nor more lack behind in the content of nutrients. It is much convenient and compact option that we have. You must know that the apples are an excellent source of insoluble and soluble fiber. The soluble fiber helps in controlling the cholesterol in our body, and insoluble fiber makes your digestive system strong. When you eat one medium size fresh apple, you get around 4 grams of fiber which is around 15 % of your daily need. But, in the merely 1/3rd cup of the dried apples, you get around 2.5 grams of fiber. when you eat fresh apples, you get a small quantity of vitamin C. But in the case of dehydrated apples, you did not get any Vitamin C as the entire nutrient is lost at the time of dehydrating process. Advantage: The dried food is portable, easy and convenient as compare to the fresh apples. You can store lots of dried food in your zipper bag and carry it along with you for any long journey. Disadvantage: The fresh apples contain very fewer calories also i.e. in one medium size apple you get around 80 calories, in 1 cup of dried apples you fetch around 209 calories. The content of water in the fresh apple fills you up much quickly than the dried food. Advantage: If you buy dried apple from the grocery store, then there are good chances of sugar in them. The manufacturers of dried foods add sugar for adding more flavor to the food. Thus, you cannot say that such food is healthy to eat as it contains lots of calories. But if you make dried apple at home, then this point is not valid. Disadvantage: As compare to the dried food, the fresh apples have its natural sweetness which does not result in the addition of calories in your daily intake. So, fresh apples are the much better option here. Advantage: The dried apple is not a substitute for fresh fruit, but it might be healthy treat or snack for your kids. You can simply eat them whenever you feel hungry on long trips or journeys. Disadvantage: Sometimes kids do not like the dried apple owing to its different taste and appearance which is different from the fresh one. If you want to increase the flavor of the dried apples then just stewed them before consuming. It can become a good substitute for the fresh apple. When the extreme weather seems to be rainy, then you must dry out the apples indoors only. Additional care should be taken that they do not get over dry in the dehydrator. 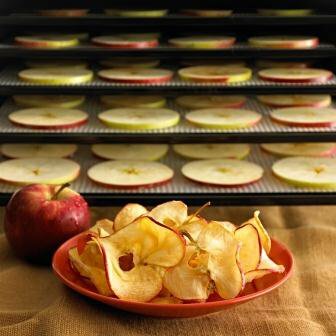 During the drying process, place the apple slices nicely on the trays so that they do not touch each other. There is no requirement to add any sweeteners while drying your apples. When you dry apples in the dryer, its natural sugar gets more increased which is relished by everyone. It will be better if you choose good quality apples for the drying process. If you soak, spray or dip the apples in the lemon juice, then your apples will not turn brown due to oxidation. The apples should be dry accurately at right temperature because if your food is under dry, then it can result in the formation of mold inside the fruit jar. If you a fitness freak person and want to add some sugar in the dried apples, then just sprinkle some cinnamon powder over them. It is not only a healthy substitute for sugar but also adds more flavor to your apples. Q: Do I Need to Ripe the Apples Before Drying Them in the Food Dehydrator? It is not compulsory that you have to ripe the apples before drying. The apples which are not ripe taste bitter as well as sour. Thus, if you want a sweeter taste, then you can ripe your apples. Q: Is It Essential to Soak the Sliced Apples in the Lemon Juice? It is not critical to soak the sliced apples in the lemon water. But if you do that then, it will not make your apples turn brown soon. The acid present in the lemon does not allow the browning of the apples due to oxidation. Q: I Have Heard That by Adding the Pineapple Juice in the Lemon Juice Make the Dry Apples Taste Sour. Is This True? No, this is not true. The flavor and early bitterness or sweetness of the apples totally depend on the variety of fruit you are using. In fact, the sugary taste of the apples gets more prominent, if you dry them for the longer period in the machine. Q: How Much Time Will It Take to Dehydrate Apples in the Food Dehydrator? The dehydrating time depends on numerous things i.e. the type of dehydrator you are using, the water content of the apples, as well as the thickness of the apple slices. The dehydration time for apples is around 12 to 24 hours. If you choose the higher temperature, then your apples get dry faster. Q: When Will I Know That My Apples Get Dried Completely? Well! Your apples get adequately dried as soon as they become leathery, crispy, and very dry. If you like to have crispy apples, then it is advisable to dehydrate the apples for the longer period. Q: What Is the Best Way to Store the Dried Apples? When your apple slices get cool, own completely, put them inside the plastic Ziploc bag or any airtight container. Then, seal them correctly and store in a dry and cool place. Q: What Is the Shelf Life of the Dried Apples? The standard shelf life of the dried apples is six months. If you seal them correctly and store in dry and cool place, then they can exist for the longer period. In fact, if you keep them in a freezer, then it also extends their shelf life more. Q: How Much Be the Quantity of Fresh Apples Will Be Required for Making Dried Apples in a Food Dehydrator? The quantity of the apples depends on the type of apple you are using and how much water content is present in them. In general, five average sizes of fresh apples produce two cups of dried apples. At last, we just want to say that the dehydrated apples are one of the healthiest substitutes for unhealthy snacks. You do not have to buy them from the market as it can be easily prepared at your home now with the help of a food dehydrator. The benefit of homemade apples over the store-bought apples is that there are no chemicals or preservatives are used while drying apples at home. You can enjoy this wonderful snack at your home while watching TV or listening songs. If you have any query in your mind then, write in the below comment box. We will be the very happy answer to your question. Besides this, if you want to share any views regarding the above article then that is also welcome. We hope you will make very delicious dehydrated apples on your own at home and share your experience with us. Best Apples to Dehydrate- Which is Best One?